Atriplex is a large genus of plants composed of around 200 different species, including types suited for growing in wildly different areas from seashores (Saltbush) to mountains and include garden orache. The plants can be shrubby or spinach like in their growth. Atriplex hortensis, also known as Mountain Spinach or Orache is an annual plant related to Chenopodium and is a member of the family Chenopodiaceae. Grown as a leafy vegetable, some varieties also make very attractive additions to the flower garden. 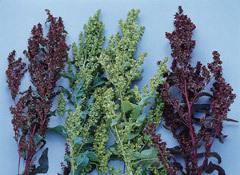 Vegetable orach is prized for its vitamin E content and is often fed to grazing animals to boost the healthiness of their meat. Atriplex varieties have also been used extensively to reclaim mining sites, as the roots are fibrous and they help to minimize erosion. The following types, ATRIPLEX CANESCENS(Four-wing Saltbush), ATRIPLEX CONFERTIFOLIA(Shadscale), ATRIPLEX CUENATA(Castle Valley Saltbush), ATRIPLEX LENTIFORMIS(Quail Bush), ATRIPLEX NUTTALLII or ATRIPLEX GARDNERI, ATRIPLEX POLYCARPA(Desert Saltbush), ATRIPLEX SPINIFERA(Mojave Saltbush), and ATRIPLEX TRIDENTATA(Trident Saltbush) seed should be naturally stratified or artificially cold stratified for 60 days prior to sowing. Check the bag about once a week. If you notice any mold forming inside the bag, remove the molded seed and throw them away. If the moisture mix appears to be dry, add enough water to moisten it and squeeze out any excess water, then re-seal the bag. Check the next day to make certain that no water is standing in the bag. If so, pour it out. If you notice any seeds sprouting, remove them and plant them. Most tree seeds require the recommended treatments only once. Do not cold stratify a seed and then fall sow. Once the initial stratification is complete the seed is ready to germinate. If the outdoor temperature warms, the seed will germinate and then may be killed by the freezing temperatures of winter. In addition, once the seed has completed stratification, it is ready to start growing. In this state the seed will use up its energy reserves at a rapid rate and will have a much reduced shelf life at warmer or cooler temperatures.